Treasures and Traps - Studio 9 Inc. 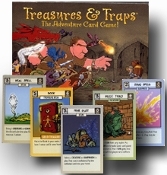 Treasures and Traps is a complete card game that puts you in the role of the hero. Your quest is to collect three treasures before anyone else. Sounds simple enough, right? Now throw in a two-headed troll, a maze of dangerous doors, and a few cunning thieves. You never know what might happen next. With 100 different cards, each game is a unique journey of wild adventure never to be repeated again! The Award-Winning Card Game from Studio 9 Games. 2-6 players, ages 10 and up. Designed and Illustrated by C. Aaron Kreader.